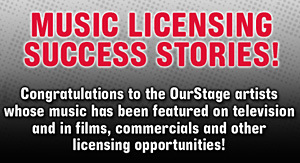 1 high-ranking video artist from OurStage's February and March competitions will be selected for a one-on-one mentor session with Stacey Park, the founder of FilmSpecific.com - the top destination for indie film distribution advice. The winning artist will be selected by Stacey Parks; all high-ranking artists from the Video Channels in February and March will be eligible to win. Prizes will be awarded according to the OurStage monthly competition terms and conditions; No additional expenses covered.